Compare prices from several car hire companies in Vitoria and find the best price for car rental. Our prices always include unlimited mileage and insurance. Vitoria is the capital of the province of Álava in northern Spain. The town has approx. 235 000 innyggere which, incidentally, is called Vitorianos or Gasteiztarras. There is a wealth of attractions and sights in the city. 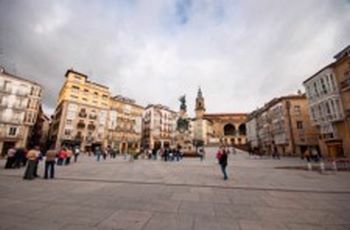 The most important are the Santa Maria cathedral from the 14th century, the Basque Museum of Contemporary Art, the Archaeological Museum, Museum of Archaeology, among other things, sculptures from Roman times, and Plaza de Espana which unites the old town with the new city. The nearest airport is Vitoria Airport, which originally was intended to replace Bilbao Airport as the largest airport in northern Spain, but instead of 4 Largest airport for transport of goods.